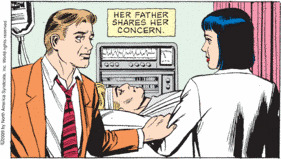 Now that Kurt has refused to take a paternity test on moral grounds, Wilbur and he are closer than ever. Actually, Wilbur and ME are closer than ever. Our bellies and touching. "In a way, it's like a part of me has always been missing - a big toe, or a pinky finger - and Kurt fills that empty space." 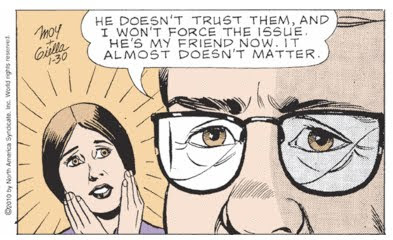 Heaven forbid something should seem strange in "Mary Worth." Since Kurt doesn't have the patented Weston Buggy Brown Eyes, a paternity test seems like a logical choice. It's door, calendar, cupboard... This whole situation! Why are there two different perspectives on one wall? Catching up is something you do with a friend you haven't see in a while. Not the illegitimate son you've never met. 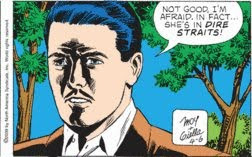 Also, you're not supposed to connect with him on many levels, or use that phrase in a sentence. Any sentence. Ever. It's just weird. But I'm glad it was nice. I thought it was nice too. It was a great conversation, and I'm happy that you decided to buy some fish on the way home. I like the way Mary says, "BLOOD." Message from Karen Moy to her readers: Whether or not Kurt is really Wilbur's son is irrelevant. Please stop worrying about it. It isn't important. Sheesh, what's wrong with you people? SETTING: An elevated boat dock on a small lake in California. It is a beautiful day. The sound of an occasional sea bird cuts through the quiet. WILBUR WESTON, age 54, sits on the edge of the dock, fishing with his illegitimate son, KURT EVANS, age 10–40. KURT wears a red trucker’s cap and women’s shoes. WILBUR: So, tell me about yourself, Kurt. KURT: You already know I like fishing. I like to write, too. I mainly do odd jobs here and there. It’s hard for me to stay in one place for too long. I suffer from an uneasy restlessness… Growing up without a dad led to problems for me… I have an uneasiness I can’t seem to shake. WILBUR: I’m sorry to hear that, Kurt! KURT: It’s okay. Maybe things will change now. WILBUR: Tell me… what was it like having Abby as your mother? KURT: Having Abby for a mother was always… interesting. KURT: Like me, she too had a restless spirit. There was a time when she moved us from place to place… Wilbur, why did you and my mother break up? WILBUR: When I was seeing her, she was a beautiful girl from town who attracted many campus admirers. One was a nasty rich kid who didn’t tolerate people outside his social circle… but he made an exception for your mother. I felt threatened when Abby started spending time with my rival. One night we had an argument about it… She left town soon afterward, and I never saw her again. I regret the things we said to each other! It was the last time we spoke. KURT: Don’t feel bad. My mother didn’t talk about the past… But I could tell from the photos she kept how much you meant to her. I’ve been restless all my life… with a constant feeling of something missing. WILBUR: I’m sorry you didn’t grow up with a father, Kurt. KURT: It’s not your fault, Wilbur. You didn’t know. Besides, I’m lucky I had my mother as long as I did. 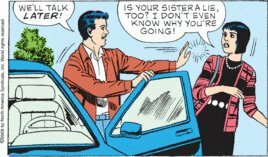 WILBUR: Still… it must have been difficult. I wish there was something I could do to help. KURT: Spending time with you like this helps. WILBUR: Kurt, your mother MUST have had companions when you were young. I can’t believe you had no one to call a father figure when you were growing up! KURT: Sadly, there was no one steady I could call my dad. People came and went out of our lives. My mother never stayed in one relationship for long. We were fine, though, just the two of us. We managed to get by! ...She was always able to sell her paintings and photographs. WILBUR: Yes, she was a creative person... A true original. 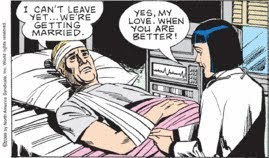 I love how Kurt, over the last few weeks, has subtly revealed that he's a bit restless. Fortunately, restless people make excellent fishermen. What with all the bouncing around and loud noises they make. SETTING: A pathway lined with nondescript bushes at Local University. Wilbur, innocently eating an ice cream cone and carrying a fishing pole, enters stage right. His rival, Nasty Rich Kid, enters stage left. Wilbur: Well, well, well. We meet at last. Nasty Rich Kid: Indeed. I wondered when our paths might cross. Wilbur: It has been four long years, my rival. Things might have been different, if you hadn't been so nasty. And rich. Nasty Rich Kid: And if you hadn't been so charming and affable. Clicking and connecting with Abby. Over and over again. But your goodness and fisherman's ways could only carry you so far into her heart. You never can compete with my nasty money! Wilbur: We'll see about that, rival! Nasty Rich Kid: You're already too late. I gave her some of my money and she's left town. You'll never see her again! Bwah hah hah hah! Well, that's putting it delicately. 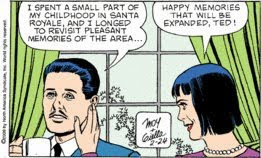 Since June of 2008, Mary Worth and Me fans have been asking King Features Syndicate to add Mary Worth to their Cafe Press store! Guess what: Here it is! "Like me, she too had a restless spirit. In fact, our feet get so restless, that sometimes our legs just up and walk away, leaving our torsos abandoned and lonesome." For those who enjoy the Charterstone Jukebox, I added another song yesterday. "I have an uneasiness that I can't seem to shake. Plus, sitting in this tackle box gives me a regrettable discomfortableness. However, gently touching my daddy's elbow makes the fishhooks in my posterior feel so much more vague." I also like to wear women's shoes. "Kurty-Wurty, your real daddy and I knew each other for three months in 1977. I was a wild and carefree local girl and he was journalism student at Local University. When I learned I was expecting you, I ditched him so I could raise you all by myself. You'll really like him. Here are forty-seven photos of us together having a wonderful time. When I'm dead, find him, bring him these photos, and go fishing with him. Happy birthday, my great big seven-year-old." Dear reader, Brian, has pointed out that the Seattle PI has started allowing readers to rate each comic strip they print. 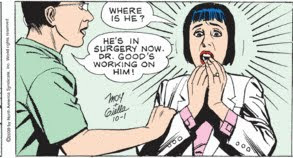 It's a great opportunity to let the editors in Seattle know how you feel about Mary Worth. It's a good thing we've established the fact that Kurt is indeed Wilbur's son. If they didn't look so much alike perhaps we would have suspicions, but given the obvious physical similarities, there is no reason to be nervous about them alone together down by the deserted river bank, bonding with each other, too far away for anyone to hear Wilbur screaming for help. I hope you have enjoyed the new song I added to the Charterstone Jukebox yesterday. 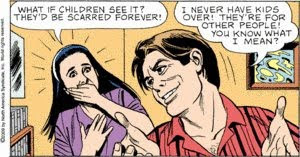 Kurt is clearly four or five years younger than Dawn. So why are we all okay with this? To our newer readers, welcome! Don't forget to read your FREE Secret Message. Just hold your cursor over each image. And I have some sad news for you. According to Edward F. Maroney at the Barnstable Patriot, the Cape Cod Times has cut Mary Worth and five other strips. 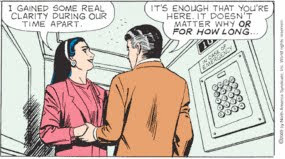 I can understand jettisoning "The Lockhorns," but Mary Worth? Don't we value good old fashioned meddling anymore? 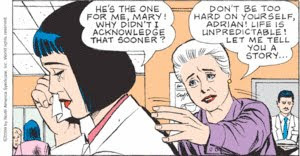 I admit, this current story has gotten a bit risque and sickening, but in general, Mary Worth inspires us to be better people. And it is the funniest strip in the paper. This proves paternity! Look how Kurt eats! I can hardly wait for that tender, awkward moment when Wilbur and Kurt, both thirsty after admiring Wilbur's Clark Kent days and eating a tray of deep fried pizza poppers, reach for the same glass of milk. "No, son, you drink first." Well, we're off to a very promising start. I loved this story when it was a movie and Will Ferrell played Kurt, and James Caan was his dad, Wilbur, only Kurt was named Buddy the Elf in the movie and Dawn was his brother who didn't like Kurt until he threw really fast snow balls in Central Park. It is my favorite Christmas movie. 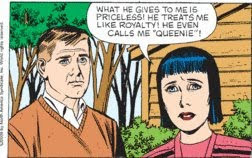 Hopefully we won't find out that Mary Worth sits on a throne of lies. 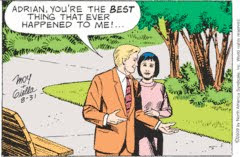 WELCOME to the Second Annual Worthy Awards, celebrating Mary Worth's greatest achievements in 2009. Hundreds of votes have been cast in each of five categories. Tonight we honor your favorite moments! But first, please be sure to visit this year's Worthy Award's sponsor: Harriet Carter: Distinctive gifts since 1958. I'm sure this is where my grandmother used to get my Christmas presents. These gifts are guaranteed NOT to be re-gifted. Who would dare? Each year, our highly partial panel of judges on the Charterstone Condo Board selects one lucky recipient of the Aldo Kelrast award. This special award is given to a character who died. This year, the Aldo goes to Officer Millet, better known as Scott Hewlett's Colleague, who was brutally murdered in a drug raid at the Santaroymart Warehouse, and then quickly forgotten as we worried endlessly about Scott's numb leg. Congratulations! 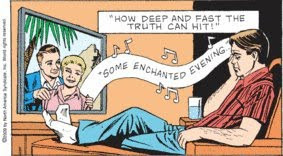 After Ian Cameron's swim trunks took this award last year, this is a welcome relief, although it does imply that Mary Worth readers like a lot of skin. Proving once and for all that their are no small parts, only small comic strips. This is Adrian Corey's first Worthy Award, but not her first boy friend. Nor her last. All of tonight's nominees were selected by the extremely partial Charterstone Condo Board. But remember, the winners were chosen by you. You should be very proud. This year's panel reminds us why we all love Joe Giella. You can take the artist away from the Super Hero, but you can't take the Super Hero out of the artist. 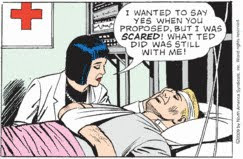 Mary Worth could use a few more shootouts, don't you think? The Queenie and Ted! Long Live the Queenie! Well, it has been quite a year in Santa Royale! And 2010 is already shaping up nicely, what with Wilbur Weston's love child showing up to live with him and Dawn. So here's to the coming year! And a special thanks to Karen Moy and Joe Gielle for all they do to keep us entertained. And an even bigger thanks to you, Dear Reader, for your willingness to put up with this blog, and especially for all your wonderful (family friendly) comments. You put a smile on my face every day.